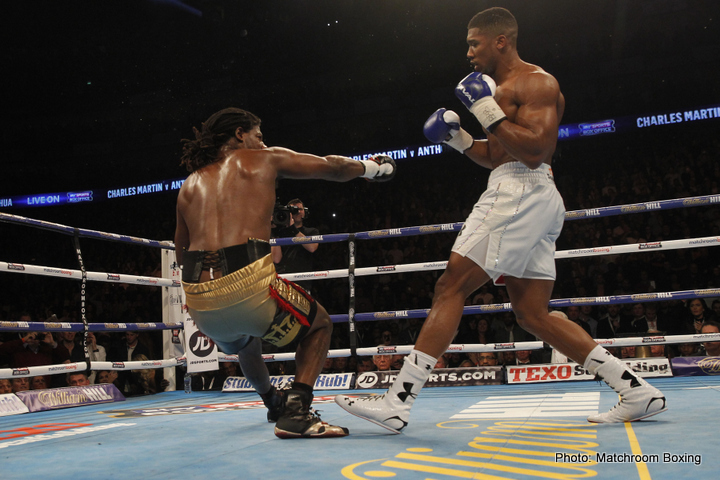 Anthony Joshua 16-0-0 at the O2 Arena, London England has made short work of Charles Martin now 23-1-1 knocking him out in the second round of their IBF Heavyweight championship bout. In the first round Joshua came out looking to be the aggressor and caught a cautious Martin with a number of right hands. Martin a southpaw replied in kind with a left hand down the chute but it was Joshua who was clearly the aggressor in moving forward trying to engage a wary Martin. The second round started in the same way, Joshua coming forward in moving Martin backwards, tagging Martin with a crisp left hand. At the two minute mark he caught Martin with a thunderous right that sent him to the canvass, Martin while down looked over at his corner with a bemused look on his face before getting up at the count of eight. With 1:45 remaining in the round Joshua came straight on walking down the back pedaling Martin, seven seconds later he drilled him with another right hand, sending him to the canvass for a second time in an almost carbon copy of the first knock down. Martin was unable to beat the refs count despite an attempt on his part to question the count, but it was evident the refs counting was clear and concise. Over at the 1:23 mark in the second round, Joshua barely having raised a a sweat in front of thousands of adulating British fans. Joshua for the sheer enormity and power of the man will be a handful for any other heavyweight in the world. If he catches you he will hurt you irrespective of whose chin it is in the division. It now seems inevitable that the boxing Boy wonder of Nigerian lineage who grew up in London is on the path to a show down with WBO, WBA and IBO title holder Tyson Fury. This fight will have huge ramifications for the heavyweight division while also enamouring the winner in domestic bragging rights of whose the best British heavyweight in the world.